Everyone has their methods to keep the household in line and under control. Some are a little more over the top than others, but if it works then that’s alright. This method is probably better suited for those that just love to micro manage every detail of their family’s lives, as well as those that prefer to have a gadget to do even the tiniest tasks. This electronic device will let you know of daily tasks that recur as well as new ones for that particular day. 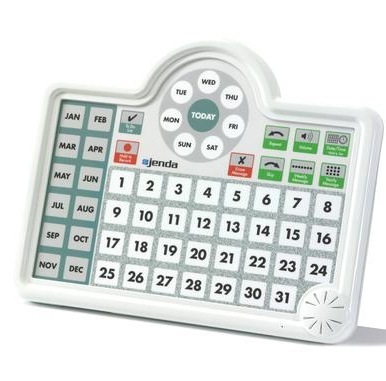 The Jenda Voice Calendar will mount to your refrigerator door with heavy magnets, which are thankfully provided. Of course, if you really aren’t fond of listening to a recording of your own voice, you’re probably not going to be all that fond of this gadget. In order to work it, you just select the month, then the day and hold to record. It has a flashing button marked “today” when there is something that you need to know about that particular day. For recurring events, you just have to record once, you can also create an audio ‘to do list’. It runs on 3 AAA batteries and can be purchased for $39.95.